(Nanowerk News) In the 1970s and 1980s, tissue engineers began working on growing replacement organs for transplantation into patients. While scientists are still targeting that goal, much of the tissue engineering research at MIT is also focused on creating tissue that can be used in the lab to model human disease and test potential new drugs. This kind of disease modeling could have a great impact in the near term, says MIT professor Sangeeta Bhatia, who is developing liver tissue to study hepatitis C and malaria infection. Like other human tissues, liver is difficult to grow outside the human body because cells tend to lose their function when they lose contact with neighboring cells. “The challenge is to grow the cells outside the body while maintaining their function after being removed from their usual microenvironment,” says Bhatia, the John and Dorothy Wilson Professor of Health Sciences and Technology and Electrical Engineering and Computer Science. Bhatia recently developed the first stem-cell-derived liver tissue model that can be infected with the hepatitis C virus. She has also designed thin slices of human liver tissue that can be implanted in mice, enabling rapid studies of potential drugs. Researchers at MIT and the University of Pennsylvania successfully grew blood vessels within liver tissue grown in the lab. 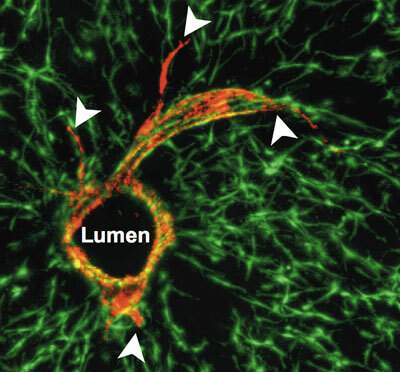 The red circle is a cross-section of the vessel, and endothelial cells (red) sprout from the surface of the tube. In a large-scale project recently funded by the Defense Advanced Research Projects Administration, several MIT faculty members are working on a “human-on-a-chip” system that scientists could use to study up to 10 human tissue types at a time. The goal is to create a customizable system of interconnected tissues, grown in small wells on a plate, allowing researchers to analyze how tissues respond to different drugs. “If they’re developing a drug for Alzheimer’s, they may want to examine the uptake by the intestine, the metabolism by the liver, and the toxicity on heart tissue, brain tissue or lung tissue,” says Linda Griffith, the S.E.T.I. Professor of Biological and Mechanical Engineering at MIT and leader of the research team, which also includes scientists from the Charles Stark Draper Laboratory, Zyoxel and MatTek. Another near-term goal for tissue engineers is developing regenerative therapies that help promote wound healing. “Healthy cells sitting adjacent to diseased tissues can influence the biology of repair and regeneration,” says MIT professor Elazer Edelman, who has developed implantable scaffolds embedded with endothelial cells, which secrete a vast array of proteins that respond to injury. Endothelial cells, normally found lining blood vessels, could help repair damage caused by angioplasty or other surgical interventions; smoke inhalation; and cancer or cardiovascular disease. The implants are now in clinical trials to treat blood-vessel injuries caused by the needles used to perform dialysis in patients with kidney failure. Better repair of those injuries could double the time that such patients can stay on dialysis, which is now limited to about three years, says Edelman, the Thomas D. and Virginia W. Cabot Professor of Health Sciences and Technology. Similar scaffolds could also help heal serious injuries such as smashed bones, which are very difficult to repair. Griffith and George Muschler, an orthopedic surgeon at the Cleveland Clinic, have developed ceramic scaffolds coated with immature blood cells taken from a patient’s bone marrow, which are now being tested in animals. One of the earliest successes of implantable tissues was the development of artificial skin, which is now commonly used to treat burn victims. Skin was a good place to start because its function is easier to mimic than that of more complex organs such as the heart or liver, says Robert Langer, the David H. Koch Institute Professor at MIT, who was one of the pioneers of the technology behind tissue engineering, along with Ioannis Yannas, MIT professor of mechanical engineering. Langer is now working on more complex tissues, such as cardiac-tissue scaffolds that include electronic sensors and a synthetic polymer that could restore vocal-cord function in people who have lost their voices through overuse or other types of damage. One major challenge for designing implantable organs is that the tissues need to include blood vessels that can connect to the patient’s own blood supply. In Langer’s lab, researchers are working on inducing blood vessels to form by growing cells on nanopatterned surfaces. In Bhatia’s lab, where tissue-engineering research is evenly divided between modeling diseases and working toward implantable organs, researchers recently developed 3-D liver tissues that include their own network of blood vessels. In a recent paper in Nature Materials, Bhatia and Christopher Chen of the University of Pennsylvania described how they built the tissues by printing a 3-D network of sugar molecules, then growing liver tissue around it. After dissolving the sugar, they stimulated blood vessels to fill in the space left behind.